Ford CEO Alan Mulally sits in the driver's seat of the new Mustang in Times Square in New York on Thursday. DETROIT -- Ford Motor Co. CEO Alan Mulally, considered one of the leading candidates to take the top job at Microsoft Corp., is not leaving the automaker until the end of next year, said Edsel Ford II, a company director. “Alan is staying through the end of 2014 and that’s all I know,” Ford, great-grandson of company founder Henry Ford, said on the sidelines of the introduction of the new Mustang in suburban Detroit today. Ford’s directors haven’t pressed Mulally to make a public statement to clarify that he plans to stay with the automaker because he’s made his intentions clear to the company’s board, Edsel Ford said. “Frankly, he has told us that his plan is to stay with Ford through the end of 2014,” Edsel Ford said, reiterating what the automaker and Mulally have said previously. Mulally, 68, has reversed Ford’s fortunes since arriving from Boeing Co. in 2006. He is considered one of the top candidates to replace Steve Ballmer as CEO of Microsoft, according to sources familiar with the tech company’s deliberations. 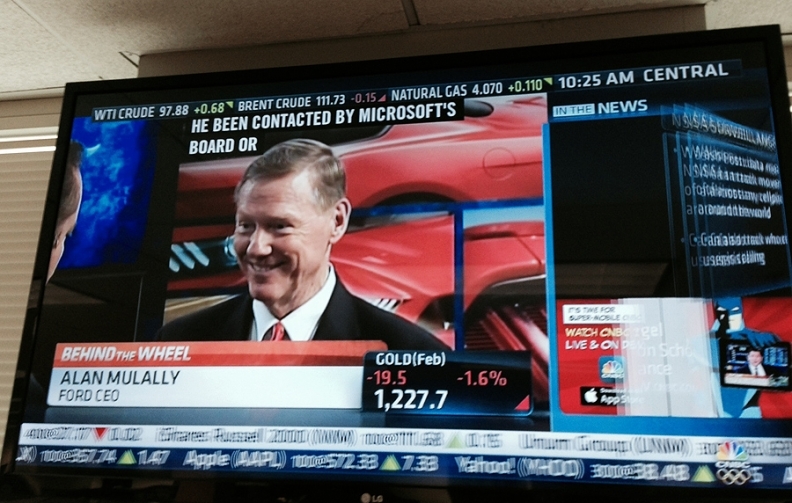 CNBC's Phil LeBeau to Mulally: "You didn't answer my question." When asked directly about the situation this morning live by CNBC reporter Phil LeBeau, Mulally sidestepped the question. LeBeau then said to Mulally, "You didn't answer my question." Mulally responded, "I did answer your question. I'm honored to serve Ford." Reuters and Leslie J. Allen contributed to this report.